The Altador cup has a huge number of fans coming from all walks of life, so what better way to make some neopoints than selling slushies to the thousands! 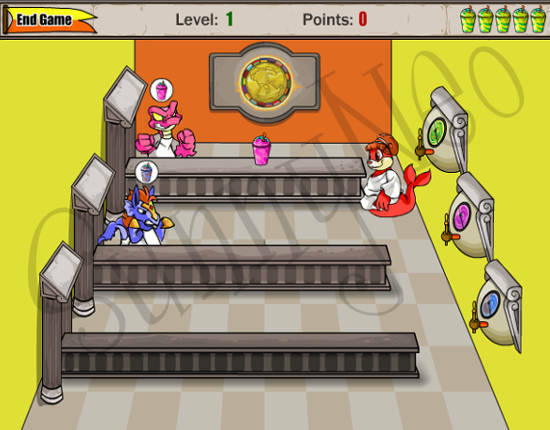 Slushie slinger is one of the 3 games playable for the Altador Cup, this being slightly harder than Make Some Noise, but not as difficult as Yooyuball. Your job as the Tuskaninny Waitress is to serve as many customers as possible before they reach the end of the counter. The shop wall colors depend on the team you play for. Above pictured is for Altador. You control the Tuskaninny Waitress serving customers coming in for a refreshing slushie. Behind the Tuskaninny are three slushie machines with three different flavors inside. In front of the Tusaninny are three counters where customers will slowly progress down awaiting their favored slushie. Use the up and down arrow keys to move from counter to counter or machine to machine. Use the left and right arrow keys to turn the tuskaninny toward the machines or customers respectively. Use the space bar to fill a slushie or to send the slushie down a counter towards the waiting customer. There are a few things to note in this game. Matching their slushie gives extra points, but you do NOT have to give them the slushie they ask for which this comes in handy when things move faster. So you gain points for giving a customer a slushie, more points for matching the slushie they are asking for, and for picking up an empty cup. You have 5 slushie icons on the top right side of the game. If you lose them all, the game is over. You can lose a slushie icon a few different ways. First, if you send a slushie down a counter where no customer is waiting, you'll lose a slushie. When the customer sends the empty cup back, if you don't catch it and it falls to the floor, a slushie icon will be lost. Also, if a customer reaches the end of the counter and turns around upset, you will lose a slushie icon. Make sure you pay attention to the counter lengths. The first top row is shortest - the customers will reach the end first as well as empty cups. If you send a slushie down the second row, then the top, you may have two empty cups coming back at the same time and risk dropping one. Either work top to bottom, or pause before you release a new slushie working upwards. So if you had only someone in the third bottom row, and someone appears in the second row, fill the slushie, pause, and then send the sluhie. 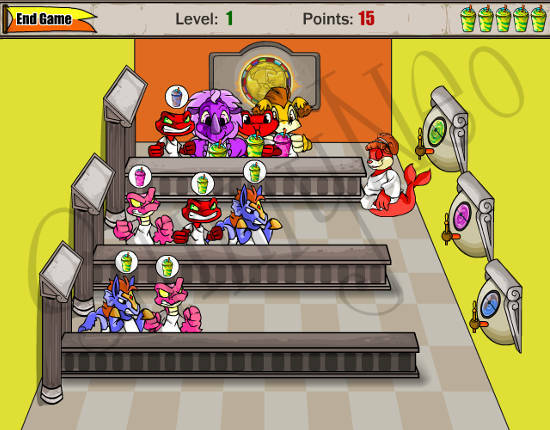 At a certain point the customers will be moving up the counters very quickly, and cups will be coming back at fast speeds. At a certain point you will have to stop caring about matching their desired slushie, and send them any to save a slushie life icon. You may not get as many points, but you can extend the game further this way. Many people dislike how slow the game is at the beginning. A tip, load the game and give it a minute so that customers are filling in the rows - but not too many. Then, work on filling orders and catching all the empty cups at once, one row at a time. This helps get past the slowest portion at the beginning. You can also get an avatar by playing Slushie Slinger (or any of the other Altador Cup games).